Pacific Symphony is proud to honor volunteer Sharon Stewart at the 2019 Spirit of Volunteerism Awards Luncheon at the Disneyland Hotel Grand Ballroom for the dedication, enthusiasm, energy and graciousness she brings to her role as Symphony volunteer. Sharon continues to go above and beyond her duties as a long-time volunteer and has a 29-year track record of volunteerism with the Symphony. Sharon Stewart has been a volunteer with Pacific Symphony and a member of the Pacific Symphony League since 1990. She is the founder, key volunteer leader and chief operations manager for the Symphony Shop, which started in 2000 when another League member suggested they sell small items to concert-goers. She began selling travel mugs, key chains and blankets to raise money to support the Symphony’s education programs. Now, the popular shop sells a variety of souvenirs, music mementos and memorabilia of Pacific Symphony. The Symphony Shop operates in the lobby of the Renée and Henry Segerstrom Concert Hall during Pops and Classical series concerts and at the Pacific Amphitheatre during the summer. Because the shop is completely mobile, she oversees the store’s set-up and tear-down, its displays and tables, as well as the volunteer staff at every concert. She is in charge of buying merchandise, and she oversees inventory of all items for sale. 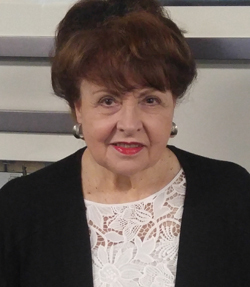 In addition to her primary duties with the Symphony Shop, Sharon is a long-time volunteer for the orchestra’s education programs, which includes providing assistance for the Class Act Youth Concerts every year. Her passion for music education was the impetus for her initiating the store and she is a strong advocate for the Symphony and arts education. She believes in bringing new members to the League and new audencies to concerts. Sharon was born in Covina, attended Whittier College, moved around Orange County, and even lived in Pennsylvania before settling in Anaheim Hills in 1989. She attended many concerts and events at Segerstrom Center for the Arts before attending her first Pacific Symphony concert and later joining the League. Sharon also volunteers for Placentia-Linda Hospital, is a long-serving volunteer for Bowers Museum since 1990, has volunteered for local schools and their library programs and is an active member of book carnival in Orange. She is a passionate volunteer and advocate for the Greyhound Adoption Center in El Cajon and is devoted to efforts to close racetracks. Sharon has a big and loving family comprised of three children, five grandchildren, two rescue Greyhounds and three parrots. Sharon’s enthusiasm for the orchestra has inspired generations of volunteers, not only at the Symphony Shop, but at all the events and programs for which she donates her time and talents. Pacific Symphony thanks Sharon for her extraordinary volunteer efforts and her commitment to the arts in Orange County and beyond. 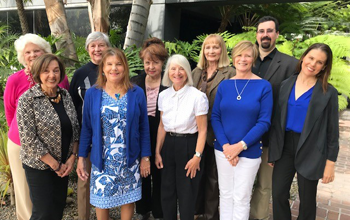 The League was founded in 1990 when Marcy Mulville, Joyce Hanson, Janice Johnson and Pat Weiss met to organize a new volunteer support group for Pacific Symphony. The original purpose was to raise funds in support of Pacific Symphony, educate young people in Orange County about music and promote interest in the community for Pacific Symphony and its projects. During the many years that have followed, the League, Pacific Symphony’s largest and longest-serving support group, has continued to fulfill that purpose by being the premier volunteer opportunity of Pacific Symphony. Education and community outreach programs have been, and continue to be, the League’s primary focus. Don’t we look like a fun group? We are and we do many fun things together, from volunteering at Symphony concerts to enjoying musical luncheons! Consider joining our membership today as we share our love of music and music education for youth with our community! For more information on how to volunteer with Pacific Symphony, contact Volunteer Services at (714) 876-2353 or by email.